Keeps Me Smiling: Nova Scotia Here We Come? Nova Scotia Here We Come? We've already cancelled one vacation this year due to cold & flu, but we are not giving up yet! 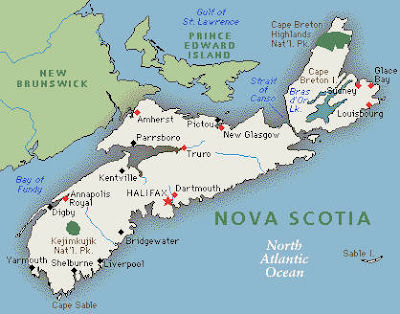 Next destination on the calendar is Nova Scotia in Atlantic Canada. This time, I'm dreaming of actually making the trip, without doctor visits or portable medicine cabinets. We will fly overnight from San Francisco to JFK, and connect to Halifax in the morning. From there, we'll recuperate at the Hilton Garden Inn, head into Halifax for dinner, and make our way up to Cape Breton Island the next morning. We have a few reservations in place, but the rest of the days are open so we can follow our noses. Special thanks to Doug at Authentic Seacoast Resorts for connecting on Twitter, which provided some of the motivation behind this trip! Oh, what was that? Why Nova Scotia? Well, about a hundred years ago when I was in college, I spent my junior year studying in Scotland. It was a splendid year, with fantastic scenery, crazy outdoor adventures, and newfound friendships. I'm not quite ready schlep the family across the Atlantic this particular summer, but I am ready to see some Scottish scenery on this side of the pond. But no, this time I won't be submerging myself in icy waters. I'll happily paddle around on top, instead. So stay tuned for the 'family vacation' version of this upcoming trek - that is, if we actually make it to the airport this time! 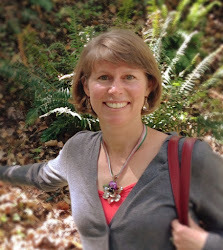 There are more vacation dreamers hanging out with Mara at Mother of All Trips, a fantastic travel blog for kids and families! If you have a chance, check out her Mondays are for Dreaming columns, a great way to get your creative travel juices flowing. This is totally not a place I'd think of visiting, so I'm really hoping you do make it (without need for any meds) and will write about what it's like. Sounds like you'll have lots of flexibility to follow your whims, which is always fun. Have a fabulous trip! And, please, please, please include some video in that vacation photos post. Mara, Amy - my husband isn't such a big fan of cold weather either - it took some convincing! Doug, thanks, I will check out the 101 things to do, we'll need it with the kids! Tiffany, you bet there will be video, warming up the camera now! Can't wait to read all about it. Is that you in the orange suit? What an adventurer. I would love to go to Novia Scotia. I bet it will be amazing.